For those in the know, Norwegian five-piece Leprous has long been deserving of more praise than it received for merely being Ihsahn’s live band. 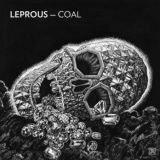 2011’s Bilateral was an excellent album, validating said praise entirely, yet it’s good to see that follow-up and potential difficult third album Coal is another jewel in the band’s crown; in my opinion the best material from Leprous to date. Following much in the same footsteps as Bilateral although building on its strengths, you could view the title of Coal as something of a metaphor, something that you dig in to find diamonds but also something that you burn to keep warm, and the album fits from either perspective. You barely have to dig to find gems, for one. Opener Foe begins with slamming, almost industrial pounds, Einar Solberg’s majestic vocals following soon after, building up with wordless ‘ahhh’s layered atop other vocals and melodic trills to rather beautiful effect. Chronic follows, built upon piano trills and pounding drums with moments of blasting heaviness, sounding rather like Muse given some drugs and pointed in the direction of awesomeness. It builds up to something like recent Devin Townsend, all big groovy riffs and epic vocals with a touch of the avant-garde. That avant-garde focus is only extended and given more leeway on the following title track, strange squelchy electronic effects laced over the muddy riffs with moments of pure chaos, turning doomy and foreboding as the song progresses, leading up to another Devin Townsend-y epic flourish. It’s unfair, incidentally, to keep referring to Leprous in terms of so many other bands (as it is with every other band, of course) as the Norwegians are clearly forging a path of their own, obvious from listening to more than one moment. Coal just isn’t an album that combines moments stolen from bands, as some try and get away with. The songwriting as a whole is simply stellar. Rather than making hooks poppy and instantaneous, the band lets them develop slowly, sometimes taking an extra listen to unlock properly but lending the album longevity because of it. It’s a warm, emotionally-invested album, having a grandiose melancholic vibe, chiefly helped by the soulful vocals of Einar Solberg. His vocals are an amazing fit with the music, riding over the riffs and backing melange of keyboards and electronics and carrying it all along in a flurry of activity, even on the lighter tracks. Speaking of the lighter tracks, one mark of a quality prog band is an ability to write a non-boring ballad-type song, and Leprous easily pass the test with The Cloak, focusing on Solberg’s vocals but not neglecting the instrumental backdrop which the band makes solid and heavy yet not radio-unfriendly. It forms something of a duo with the following The Valley, a longer, proggier piece with jagged yet melodic riffing, the guitars and the vocals forming a kind of duo of their own. As good as they are, and the song itself is, you’ll have to wait for closing track Contaminate Me to hear a real duet, however, Ihsahn himself popping up for a guest vocal spot with his voice at its most tortured and harsh. The song stands out from the others, being a darker piece that only introduces said darkness as it progresses, leaving you at one point with screeching violin and Ihsahn striking out in chaotic yet unified angst. It’s a great song, and an excellent finish to an already great album – one I’d be quite happy to place alongside Ihsahn’s solo albums as quality modern progressive metal, if such a comparison were necessary. It isn’t; this is a mature, sophisticated album from an excellent band. The world will likely belong to Leprous after the next album – enjoy this as one in the know.